Don’t Come Knocking is the first collaboration between Sam Shepard and Wim Wenders since the classic Paris, Texas in 1984, and comparisons are unavoidable. The first few moments of the film feature washed up movie star Howard Spence going AWOL from his movie set, tearing across the open countryside on horseback. Just why he’s leaving isn’t exactly clear, and as with most of Wenders’ work, it’s the unspoken and undecipherable actions that make for the majority of the storytelling. 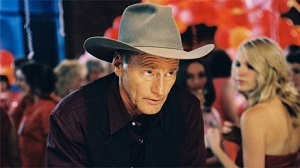 Sam Shepard not only wrote but stars in Don’t Come Knocking (apparently Wenders begged him to be in Paris, Texas until finally settling for Harry Dean Stanton), and his character isn’t very accessible. His stoic and disconnected has-been movie star seems to be having the type of 3/4-life crisis that manifests in long silences rather than emotional outbursts (comparisons with Broken Flowers aren’t unjustified, either). It’s up to the supporting cast to add colour, from the extreme (Fairuza Balk’s whiney Amber and Tim Roth in yet another brilliant turn as the investigator sent to bring Howard back) to the more down to earth (Jessica Lang as Howard’s former fling). Unfortunately it was the supporting cast that primarily held my attention. Howard was just a little too hard to reach, and I found myself looking forward to the subplots rather than his own often aimless journey. As such, the film felt patchy, and only just managed to wrap up all the elements in the last ten minutes or so. As usual with Wenders, Don’t Come Knocking is an admirably slow burn film unlike Hollywood’s usual microwave narratives, but all the same it does take a little too long to get to the good stuff. When it happens though, it is brilliant. There are a number of soliloquies similar to Harry Dean Stanton’s memorable speech in Paris, Texas, and these moments are simultaneously chilling and beautiful. I may not be the best person to rate Wenders’ films, since I quite enjoyed the generally loathed Million Dollar Hotel, but most of that spawned from the charisma of the lead characters. Shepard’s performance here was simply too dry, and gave too little away. For fans of Wenders, I’m sure Don’t Come Knocking will suffice, for others maybe not.